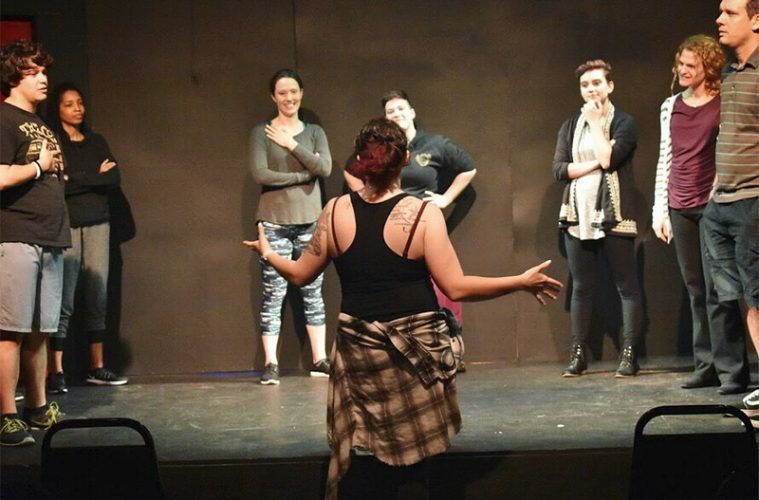 Ashley H. White leads an Intimacy Direction and Performance Practices workshop to professional actors and directors in Dallas, TX. Photo by Jessie Wallace. When the script calls for a slap, a punch, or a sword fight, it’s not unusual for theaters to hire a fight director to ensure their actors’ safety. But if there’s a kiss, an intimate touch, or a simulated sexual act, it has often been left to the director or even the actors themselves to block the scene. As more instances of sexual harassment and abuse of power are being uncovered, especially in the theatrical community, more companies are realizing they need an important addition to their creative team: an intimacy director. Ashley H. White worked with Laura Lites and Kyle Igneczi as an Intimacy Choreographer for the IMPRINT Theatreworks’s production of Murder Ballad by Juliana Jordan and Julia Nash, directed by White. Photo by Kris Ikejiri. It’s common for those who study and teach stage combat to expand into intimacy direction. The principles of each are similar, with the directors responsible for making the actors know that they are in a safe environment and that a trained person is guiding them, as well as being a liaison and advocate when necessary. Intimacy Directors International, a nonprofit that “adheres to the highest standards of artistry and safety” and of which Noble and White are members, even provides a set of pillars for rehearsal and performance practice. Those five Cs include context (understanding the story), communication (between the director, intimacy director, stage management, and the actors), consent (permission may be given by a director, script, or choreographer, but consent can only be given from the person receiving the action), choreography (which will be adhered to throughout the entire production), and closure (leave the work behind, and walk back into your real life). 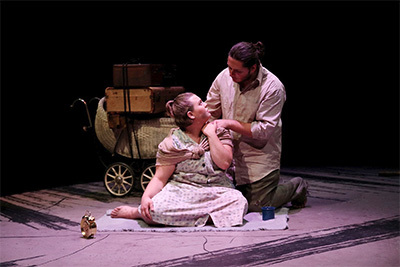 Adam Noble worked with Kelsey Busboom and Daniel Regojo as an Intimacy Choreographer for the University of Houston production of Broken Horizon, written and directed by Noble, based on the slow tempo work of Shogo Ohta Studio 208. Photo by Pin Lim. Both White and Noble say they have seen an uptick in theaters hiring intimacy directors since Gregory Boyd, Alley Theatre’s former artistic director, and Lee Trull, Dallas Theater Center’s former director of new play development, were let go following inappropriate behavior. However, circumstances don’t always have to be so extreme for people to abuse power, or for performers to feel uncomfortable. Jacob Mangum and Wesley Whitson in Broken Horizon at the University of Houston. Photo by Paige Willson. Physicality is a large part of onstage intimacy, but emotions are just as necessary for making a scene look believable. Sometimes it isn’t physical touch that crosses the line, and when not properly directed those brief, intense, sexually charged or emotionally vulnerable moments can disrupt a performer’s mental and personal safety. Lindsey Wilson is a Dallas-based arts writer and critic with a journalism master's from Syracuse University and a penchant for chips and salsa. When not at the theater (which is rare), she enjoys reading, play with her dogs, and drinking craft beer. Photo by Marni B Photography.